In the incoming tide (or was it an onslaught?) of science in the 18th and, especially the 19th century a few interesting things converged, with interesting if perhaps saddening impact on western thought. In the dawning of the age of science, leading thinkers advocated a strongly empirical way to understand the world: through observation, what we now call science. The widely held belief in this period, known as the Enlightenment, was that empiricism would reveal knowledge of the nature of Nature that would enable humans to engineer a better more perfect society--a Utopia. This society would rectify physical needs as well social inequities. At the beginning of this era, Newton's and Galileo's physics had powerfully showed that if based on observation rather than received doctrine or faith, the world followed natural law. Natural laws unchangingly governed the universe: they dictated how the stars did, do, and would forever go 'cycling on according to the fixed law of gravity'. That phrase is in Darwin's last paragraph in the Origin of Species (1859), but Darwin had anything but a static world in mind: instead, he was the century's icon of unremitting, mechanical change. But Darwin showed that life on earth was changing in a gradual, but very different way: it was evolving, and from a beginning! Darwin refined and reflected thinking by many others, who were suggesting general ideas about evolution, including about the evolution of life. Many were relating scientific ideas about laws of change to society itself: Herbert Spencer, Karl Marx, and others were suggesting that society was as much subject to laws of Nature as the earth and life were. This thinking about society, (and to some extent Darwin's thinking about life, and that of many of his contemporary evolutionists), included a strong sense of progress. In ways resembling Enlightenment Utopian thinking, they saw society as evolving from primitive states, to civilization, and on towards some idyllic end: life had evolved the noble brow of humans, and society would evolve to be more equitable. These were all about material laws, and one might think they would drive definitive nails into the coffin of changeless, religious thinking, based as it was on received word rather than observed fact. How on earth (so to speak) could anyone speak of 'Heaven'? In fact, however, at the time many writers suggested that the progress in earthly evolution was leading to a perfected end-state, often envisioned as being 'with God' and that this march of progress was in fact ordained by God. We are stimulated to write this post by yet another installment of our favorite radio program, the wonderful BBC4's In Our Time. This was a discussion of Alfred Tennyson's poem In Memoriam, AHH. 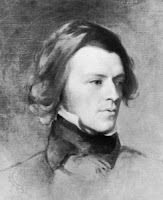 At Cambridge, the young Tennyson met an exceptionally brilliant student, one Arthur Hallam. They became extremely close friends. The program discusses their connections, and one can easily explore this on the web, including, of course, this In Our Time episode. Hallam valued the young Tennyson's poems and the two were intellectually compatible to an unsurpassable degree. But then, suddenly, while traveling in Europe and at age 22, and without warning, Hallam died, apparently from an aneurism. Tennyson was totally devastated by this news--indeed he never recovered from the loss. Seventeen years in the making, In Memoriam was his long, mournful eulogy or elegy to this closest of close friends. The poem is wonderful to read, and famous as can be (' 'T is better to have loved and lost, than never to have loved at all. '; 'Nature, red in tooth and claw.'). Its moving and palpable pathos, and its metric magnetism, cannot be equaled. If you have not read it, you really should (but do it patiently, to absorb the incredible, relentless, desperate mourning). Of British intellectuals, Tennyson was among the most interested in, and aware of, contemporary science. In Memoriam was published in 1850, some years before Origin. But evolution in life and geology were in the air, and others had been writing about evolution (in particular a book by Robert Chambers called Vestiges of Creation, 1844), and in the kinds of progressive terms we mentioned above. The earth and its life were working out God's plan so that its perfecting creature--humans--would eventually be worthy of, and end up with, God. The progress in society and in the more complex organisms on earth than had been here before, suggested that change was heading to a goal that the evidence made obvious. For a while, especially before Darwin, one could do as Tennyson did, and absorb the factual realities of earthly change into the teachings of some aspects of religion. But as science progressed, and the implications of biological evolution were realized, it became less and less possible to see either real progress in how life worked, or to find any evidence of a march to a specifiable, much less seeable, end on the evolutionary horizon. Eventually, the earth would burn up or burn out, and return to the unrelenting cold womb of space, and life would go with it. How could someone who had absorbed the idea of change--even progressive change--have ever got the idea that there would be a end-point? Well, if the 2nd law of thermodynamics says the universe is moving towards maximum disorder (called 'entropy'), or randomness of matter and energy, then why can't there be some biological or societal end-point? The comparable point to entropy might be when there was no social inequality, or when the mind had reached the maximum perfection (that was called 'God'). It's a stretch, because in a sense it implies there's a maximum IQ for God's perfecting creatures to reach (maybe that's God's IQ?). In any case, define it how you want, one can imagine, or invent, such states. Still, there was no evidence for them--in life, or in society. Her place is empty, fall like these. Perhaps the often-strident and prideful Darwinian atheists should take some pause. They too, and you, and we, will someday experience Tennyson's grief. Illusion? Maybe. But there is more to life than science. Tennyson's is a view not to be frivolously dishonored, even if the evolution of the science of evolution has unremittingly evolved away from any such notions of progress towards an idyllic endpoint. Or, even, from wishful thinking.